When my husband was out of town a few weeks ago, I was cooking up a storm. This is a recipe I found on Pinterest. The pin generated several re-pins from a few of my friends and family. Jeremiah asked if it was like my mom’s Hamburger Casserole but I said it reminded me more of Crockpot Chicken Casserole. Mix ingredients in a bowl and pour into a 13 x 9 pan. Bake at 350 degrees for 45-50 minutes. I halfed the recipe and cooked it in a 9 x 9 baking dish. I halfed all the ingredients except I used 1 lb. of ground beef, full serving of bacon, and a full can of soup. I cooked it at the same temp and time. I used light sour cream, 2% cheddar cheese, and real bacon. I think you could cook some onions in the beef and it would be good. When I think of Beer Cheese Soup, the first thing that pops into my mind is Lazlo’s Brewery. It’s a restaurant in Lincoln, NE. The original location is located in the Haymarket District. When I was in college, my friends and I used to walk down there to eat a lot. To this day, I could still tell you what everyone would order. Dan would get the Lazlo Burger and an Empyrean Amber Ale (made in Lazlo’s owner’s brewery). Rob wasn’t a drinker. He always got the French Dip but added Swiss Cheese and sautéed onions. He also ordered a side of ranch dipping sauce for his fries. Lazlo’s makes these great fries. They are crinkle fries with seasoning salt. And Ben always ordered a cup of Beer Cheese Soup. Ironic because Ben was the baby of the group – just 17 years old his first few months attending college. After college graduations and break-ups, I ended up working for the owners of Lazlo’s. I worked in their neighboring restaurant entitled Jabrisco’s. It was an unusual Italian restaurant named after the owners Jay, Brian, and Scott. (They also had a financial partner who was a dentist but I can’t remember his name.) They had things on the menu like a PB&J wood-fired pizza, homemade spinach pasta, and this to die for chocolate dessert. We also had this amazing patio where I would sell coffee during the weekly Farmer’s Market. I worked there for about eight months as a host/head host. I could sell the bar area better than most on a busy Friday night or Saturday home football game. Following my college graduation, I left to pursue AmeriCorps full-time. But during the time I worked at Jabrisco’s, I learned some great customer service skills, importance to details, and a lot about the hospitality industry. Today, Lazlo’s has doubled in size and now occupies the space that was once Jabrisco’s. The food is still delicious, reasonably priced, and the service is top notch. The Haymarket has also turned into this major entertainment district. 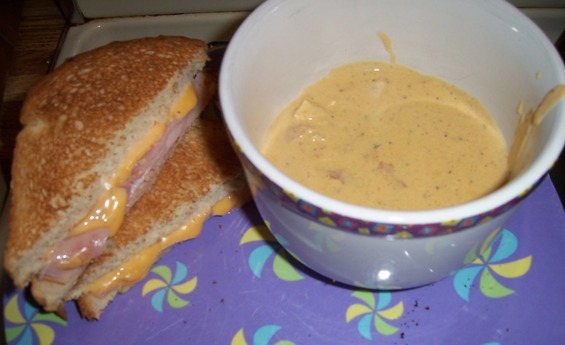 Although this recipe is very different then Lazlo’s Beer Cheese Soup, it did make me think back to some pretty cool people and an experience that greatly impacted my life. Cook bacon and chicken. In a large sauce pan, cook butter, flour, and spices. Add beer, broth, and half and half. Whisk to combine and bring to a bubble. Add cheese and stir until smooth. Add Worchester sauce, chicken, and bacon. Allow to simmer. Garnish with chives and croutons. This recipe is good but spicy. One bowl had me drinking three glasses of water, blowing my nose, and dotting my watering eyes. My recommendation is to cut the spice at least to half or maybe a third of the recipe listed above. That’s my plan for the next time I cook it. I didn’t have chicken stock so I used water and put in about 2 oz. more of beer. Veggie stock is also an option. When I make a soup like this I know I am sharing with vegetarian friends, I make meat more of a topping. Canned chicken is another option. I used about a ½ lb. chicken and pre-cooked bacon. I used fat free half and half. I think our Nutrition Manager at work also said that Fat Free Evaporated Milk is another substitute option to make a creamy soup healthier. I added parsley instead of chives. On the second day, I picked up some chicken stock and frozen hash browns. I added about 1 cup of hash browns and ¾ c. chicken stock. I also added homemade croutons. It decreased the water consumption. Some people dream of winning the lottery. I dream of winning the Pillsbury Bake-off, something most of my friends have never even heard of. Top prize is $1 million paid out in $50K increments for 20 years. Wouldn’t that be perfect? I could work, get out of student loan debt, and maybe even fulfill another dream to start my own foundation. That said, my co-worker Theresa has told me that giving away money is harder than you think. When the need is greater than the amount of money that you have, it’s hard to tell people who wrote wonderful proposals “no”. If you have been following my blog, then you know that this blog is a labor of love. I love cooking and I’m a pretty good storyteller. Viola! I share my recipes because over the years people have asked 1) What are you eating? 2) Can I get the recipe? or 3) call me saying “Help! I need to make “x” for an upcoming occasion. Any suggestions?” I started this blog to help my friends/family (as well as strangers) with some of my favorite recipes, to organize my recipes in a easily searchable way, and to make myself start trying recipes that I saved for years because I thought “that looks good” or “I’d eat that”. I don’t always love the new recipes but I put them out there for others who might. Consider my blog a long-winded recipe review. And sometimes I mess up really bad. A few weeks ago I found a picture on my friend Melissa’s pinterest page I wanted to make. I clicked to original recipe and printed it out. It was for baked seasoned red roasted potatoes with chicken, cheese, scallions, and bacon on the top. Sounds good, right? Well, I decided to change it up a little and use melted Gouda cheese and omit the chicken. I would be like my own version of Blanc Burgers cheesy fries. Let’s just say, sometimes it is easier to pay a professional chef to enjoy a favorite dish. As I read through the recipe, I noticed it cooked at 475 degrees. That’s high! I hate cooking recipes higher than 400 degrees because the second I open my oven door, the smoke detector closest to the kitchen goes off. As I looked at the recipe even closer, it said to cook the diced potatoes for 45-60 minutes, stirring even 15-20 minutes. Wow, that seemed way to long at that high a heat. I cooked for 15 minutes and they were a little toasty. The hallway smoke detector went off. I turned them and returned to the oven for another 10 minutes thinking – they would be done then. When I opened the oven this time, they were complete charred. Now all three of the smoke detectors in my one bedroom apartment were going off. One even saying “Carbon Monoxide detected, please exit immediately.” Really, it wasn’t that bad. Yes, the potatoes were burned but nothing was on fire. But I opened my front door and threw the pan outside. Eventually, all the smoke detectors stopped. I later noticed that I had frozen diced red roasted potatoes in my freezer. Upon reading the directions, I learned you bake the frozen kind for 20-30 minutes at 450 degrees. So I’m pretty sure the person who posted that recipe meant to write 375 degrees or 45-60 minutes. I guess no blogger is perfect. I know this recipe is different then the one I was just talking about but it turned out perfectly. Plus, it is a Pillsbury recipe. Quick, easy, and delicious. Consider making this recipe for breakfast. They turned out very puffy. Preheat oven to 350 degrees. Whisk eggs, salt, and pepper in a small bowl. Spray 24 mini-muffin cups with non-stick cooking spray. Wrap a tater-tot with bacon. Place on piece on portion of crescent roll and tighten around tot. Place standing up in mini-muffin cup. Complete remaining 23 bites. 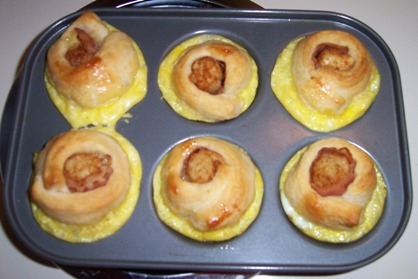 Pour approximately 1 T. of egg around crescent roll to fill each mini-muffin cup. Bake 13-20 minutes until golden brown/egg cooked. Nutrition: (12 servings – 2 bites each) 180 calories (100 calories from fat), 11 g. fat (3.5 g. saturated fat, 1.5 g. trans fat, 95 mg. cholesterol, 440 mg sodium, 12 g. carbs, 0 g. fiber, 2 g. sugar, and 7 g. protein. I cooked for 13 minutes and they were perfect. I would suggest maybe 4 eggs. I had a little extra at the end. Better yet, use an egg substitute to make it healthier. I used both mini and regular tater-tots. Both worked but you can cut some calories with the smaller tot. If you don’t want to use bacon, I’m sure you could substitute turkey or ham.